Entomophagy (aka: the practice of eating insects) might seem wild, strange, or even unappetizing to some Western-based palates, but as “The Gateway Bug” unfolds your perception of food will be challenged as the notion of edible insects as something of a quirky novelty is quickly torn away and the idea and act of seeing people consuming various insect products and dishes is instead well—not as odd a thing as you’d imagined it to be after all. Bound to become one of the next big environmental/sustainability documentaries, “The Gateway Bug” is an engaging and beautifully produced feature film that lays the foundation for mainstream audiences to better understand the concept of insects as an alternative food source, the need for such an alternative to begin with, and the challenges that such an industry faces. Let’s just say, it’s not easy to be an insect farmer or to convince people to eat cricket-based products instead of meat. 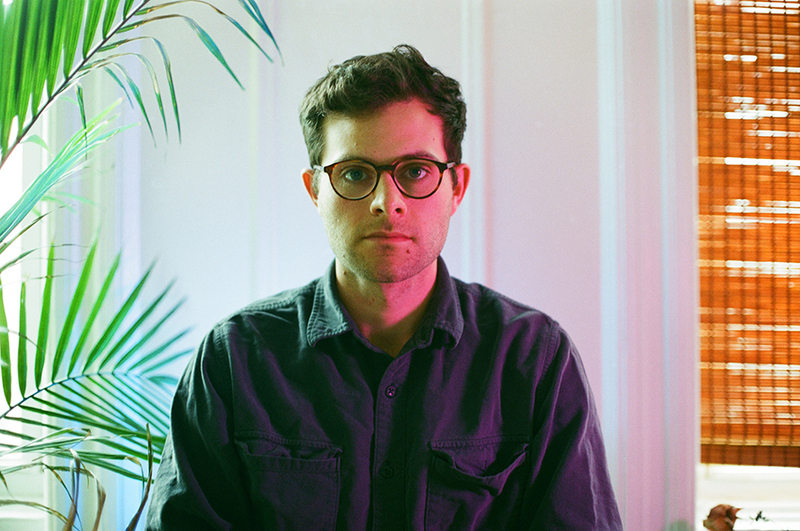 Johanna B. Kelly (director) and Cameron Marshad (editor and cinematographer) will be in attendance at “The Gateway Bug’s” Australian debut July 16th at the Melbourne Documentary Film Festival. Documentary Drive recently caught up with the duo who generously shared insight into the making of the film, the challenges they faced during production, and their favorite memories from working on the project. Documentary Drive: For a documentary in which insects and eating go hand-in-hand, it might surprise some to know that the film’s not the least bit gross or stomach-churning! How important was it for you to present the subject in a way that would appeal to a large audience–even the squeamish at heart? Cameron: Addressing the ‘yuck factor’ was important to us, but we made a conscious effort to maintain balance when doing so. It’s more beneficial to the film to show the bugs as they are, which really aren’t that disgusting, than to show them in a negative light. The concept of eating insects is a new one for Westerners, so making the subject-matter as accessible as possible while being truthful with the way the bugs are presented was paramount. Joh: We certainly didn’t want to turn viewers away when there was no reason to and we don’t believe eating insects is gross anyway. Over 2 billion people on Earth eat insects so the ‘yuck factor’ is a purely Western construct and a cultural taboo we see shifting in the very near future. 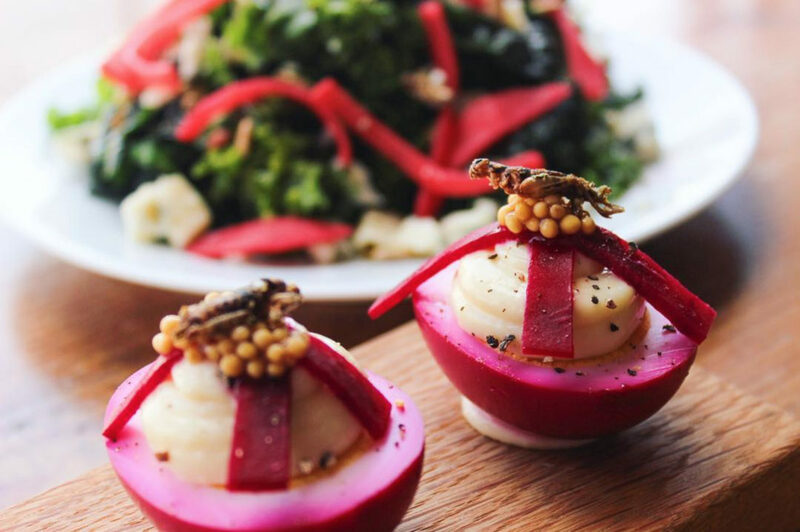 Insects are a delicacy in many nations, and just like sushi was once considered exotic and taboo, we’ve witnessed how fast attitudes to food can change and the impact marketing and exposure to new foods can have to progress this. Abattoirs and food production in overly chemicalized, processed food manufacturing is quite gross and everybody still happily eats those foods so it’s really about addressing how people see and understand the food they are eating already, and understanding the impact of the energy and resources that go into that diet, the impact that has on global warming and their health. The obesity and diabetes epidemics in the West are a pretty clear indicator we’re not on a good track with our food options and consequent choices, so “The Gateway Bug” is saying let’s look at what’s creating this situation and address how we can shift it on a daily level in our own lives to improve things. Documentary Drive: What attracted you specifically to the story of the edible insect industry in the U.S.? I read in your interview with screen-space that you, Johanna, can’t eat insects due to an allergy, so I’m curious as to where your passion for the subject comes from? Joh: A friend of ours, main character of “The Gateway Bug” and marine biologist, Tyler Isaac introduced us to the topic. He was describing his Masters research at UCSB on the food drought set to hit humanity in the next 50 years and Earth’s overfishing problems. Rather terrifyingly, we learned animal agriculture is now responsible for 80% of fresh water use, 91% of Amazon destruction, and 18% of greenhouse gas emissions (projected to increase 80% by 2050). In that same time Earth’s population is predicted to reach 9 billion and in 2013 the UN warned that food must thus increase 70% by 2050, which according to them, is impossible with our current unsustainable practices. We understandably freaked out. When we asked what he thought we could do about this Tyler told us that now infamous UN report suggests one effective strategy could lie in entomophagy (the technical term for eating insects). By the end of brunch we were hooked on the story and realized we had to make a doc about this fascinating topic. Documentary Drive: Can you both describe a challenge you faced and overcame during production? Cameron: There are many. I’d say working with such a low budget forced us to wear all of the hats. For the vast majority of the shoots, I was operating camera, lights and sound – there were a number of situations when I could have benefited from an additional camera or sound operator, and in some situations we had our filmmaker friends help us out. Doing everything yourself, learning and adjusting was the biggest challenge. A more specific example could be driving from New York to Minneapolis in a day, which was 18 hours. We made it in one piece, and ultimately captured some great footage you can see in the film. Joh: As first time producers of a feature doc, post production was pretty challenging. From developing a schedule around our existing paid commitments, to finding talent with very little budget and access to resources, we had to improvise a lot and heavily negotiate! From finding a 5.1 studio and mixer in NYC that could work with our minuscule budget (thanks Nutmeg!! ), to collaborating with emerging filmmakers who didn’t necessarily have the experience but definitely had the passion, we learned a lot about patience and juggling (our project with other people’s who kept us afloat financially throughout the 2 years it took us to make “The Gateway Bug”). We learned how to barter our skills in return for others and I think working in New York afforded us a great deal of room to move as the indie industry is really thriving here and there are many generous souls keen to work on a film so obviously created with the best of intentions to try and help humanity and the planet. Documentary Drive: Do you each have a favorite memory from your time making the film? Cameron: My favorite memories are from Youngstown, Ohio. It was a wild experience being there, I’m lucky to have gone and shot with the guys from Big Cricket Farms and have what was essentially a guided tour around one of the United States’ great, former innovation centers-turned-Rust Belt food desert. Joh: As challenging as editing a doc is I think ultimately that was the most rewarding for me because it was so hard fought for. Production is always fun and exciting, seeing new places and meeting fascinating people, setting up shots and interrogating subjects! But editing is a hard won reward which somehow makes it a longer lasting satisfaction for me. You start out with hundreds of hours of footage and whittle away, developing storylines and character arcs to create a cohesive, compelling story. Adding archival, music and animation to enhance certain parts. I’m a writer at heart and editing is really just a more active, intensive form of writing. We’d develop storyboards and plaster notes all over the editing suite only to tear them all down and completely rearrange the entire plot. I loved trawling for archival footage and coming up with an absolute gem of 10 seconds that I had the perfect spot for and then collaborating with our animator to visually bring to life some of the more complex statistics we had great audio for. It’s also gratifying to come up with so many movies, the editing suite is a really magical place where you can turn one bunch of footage into 100 films and those infinite opportunities really excite me. Documentary Drive: Are there any lessons either of you learned from this project that you will carry over to your next? Cameron: As the editor, maintaining organization in the project file was key. I was the assistant editor as well, so I logged, transcribed, marked, synced, etc the majority of the footage. I think I did a decent job considering the amount of footage we collected, but there’s always room for improvement and that will definitely be a greater focus on the next project. One more: you don’t get it if you don’t ask. We came across a lot of generous people who helped us bring the project to completion. So, continue to be forever thankful to those who’ve helped you get where you are. Joh: Prep, prep, prep! It’s a boring one but the more prep you do the better results. From storyboarding and shot listing, to editing and re-editing interview questions and thoroughly researching interview subjects (and their potential motives), scheduling, spreadsheets, the more you can prepare for every stage, the better the results. The longer you have to develop concepts and reflect on them, the better they become and the more consistent feedback you can get, the wider the appeal for your film. Documentary Drive: “The Gateway Bug” was partially funded through Kickstarter, what was the crowdfunding experience like for you and do you have any advice for other filmmakers out there who may be thinking about launching their own campaigns? Cameron: It’s tedious full-time work launching a Kickstarter. We had all of our assets in place ahead of launch, with a publicity/marketing game plan. All of that went out the window when week 2 of fundraising rolled around. Ultimately it’s your family and friends contributing, and a few people who find you via Kickstarter curation. It’s nerve wracking and frustrating, and I can’t be confident I’d do it again. That being said, some advice would be: make sure you have a month to set aside before (minimum) and during (depending on the length of your campaign), as it’s very much a full-time pursuit. Be prepared to ask everyone you know for your help. Films are much different from tangible products, which are typically campaigns you see making millions of dollars – create interesting incentives! Joh: I feel exactly the same as Cameron – it’s a very hard way to get funding and we remain humbled and honoured to those that understood our desire to get this film out there and helped us make our dreams come true. 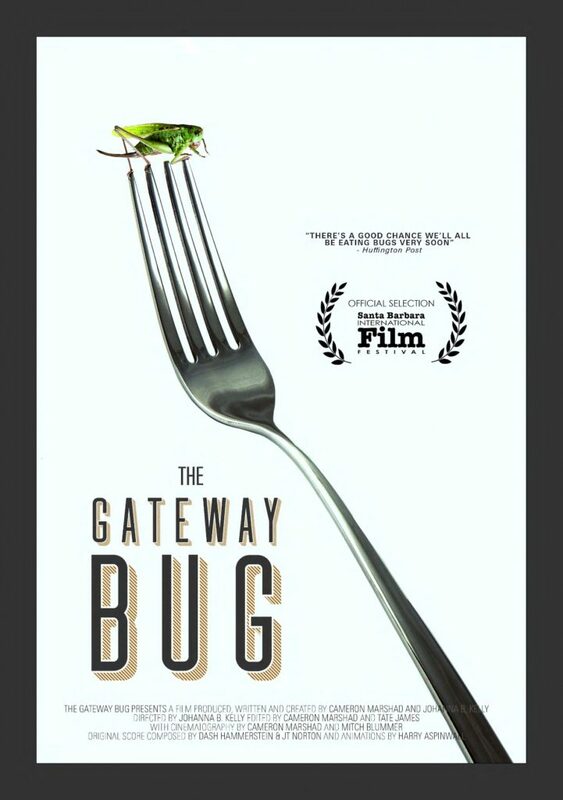 Documentary Drive: Finally, how do you hope “The Gateway Bug” impacts Australian audiences and their perception of food sustainability? Cameron: I hope it’s an eye opening experience for those who’ve never considered insects a food source. I also hope it enables Australians and Westerners alike to seriously re-consider some of their food purchasing decisions. For the vast majority of us, food shopping is farming by proxy. We can create demand for new products and resources by becoming educated on the consequences our choices have on the environment and our own bodies. 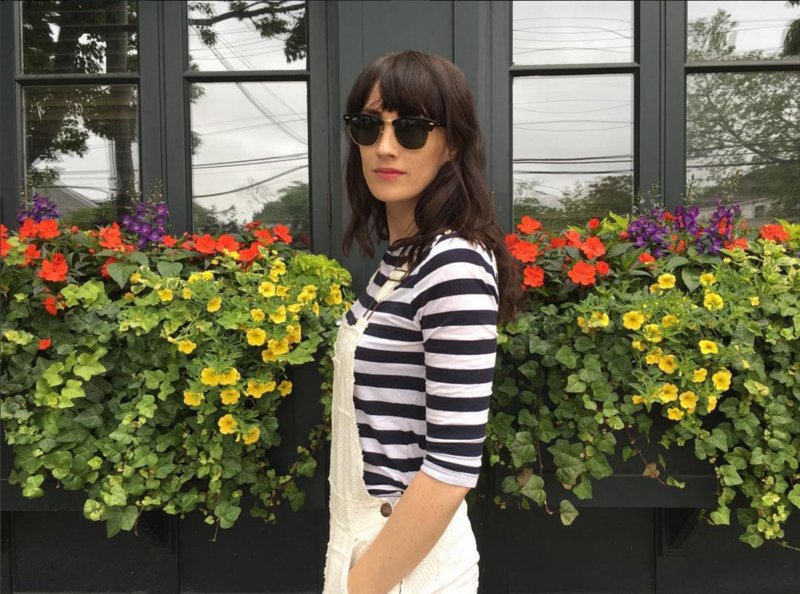 Joh: Our film aims to activate current and future generations to consider our connection to food and encourage critical thinking around how our food is made and how we define what our food is. 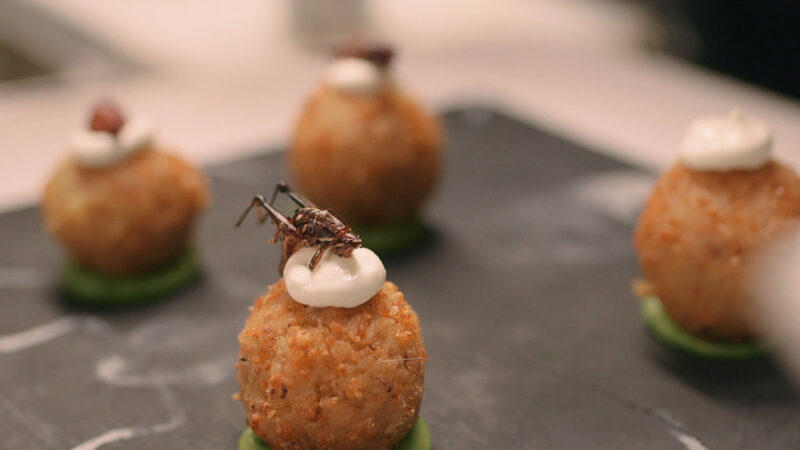 Combining educational, social, and culinary commentary; meeting chefs, farmers, scientists, celebrities, and Washington leaders, we reveal the impacts of the industrial food complex through a prism of the burgeoning edible insect industry to motivate an internal review of our audience’s current lifestyle choices. Utilizing archival footage to invoke a feeling of “Wait, we’ve been talking about this stuff for years, why hasn’t anything changed?,” “The Gateway Bug” is a call to action, to encourage new ways of thinking about food production, culture, participation and consequences. We want people to feel empowered with this new knowledge to help their environment and health through diet. What we choose to eat has a huge impact on supply and consequently the planet, so if giving up red meat seems too big a sacrifice, try Meatfree Mondays or meat at dinner only. We hope our audience considers buying less at the grocery store so they’re throwing out less food waste at the end of the week and being mindful that every item of food they buy from the cafe to the cafeteria has an environmental impact. Hopefully this increases respect for food and what it takes to get it to our table, the energy, the water, the land, the carbon footprint, and gratitude for the plentiful ways we’ve been living to enact more responsible behaviour towards sustainable systems that won’t leave humanity starving on a dying planet for future generations. To learn more about “The Gateway Bug,” visit: thegatewaybug.com and follow the film on Facebook, Twitter, and Instagram. “The Gateway Bug” screens July 16th at the Melbourne Documentary Film Festival. Tickets are available through Moshtix.